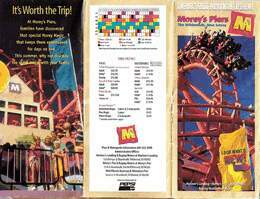 After featuring the Islander Raceway & Amusement Park brochure last week, I thought it was only fitting to have a Morey’s Piers brochure from 1996, a year when both parks were open at the same time in the same location. On the left we have a little write-up about how special a family outing at Morey’s Piers is. 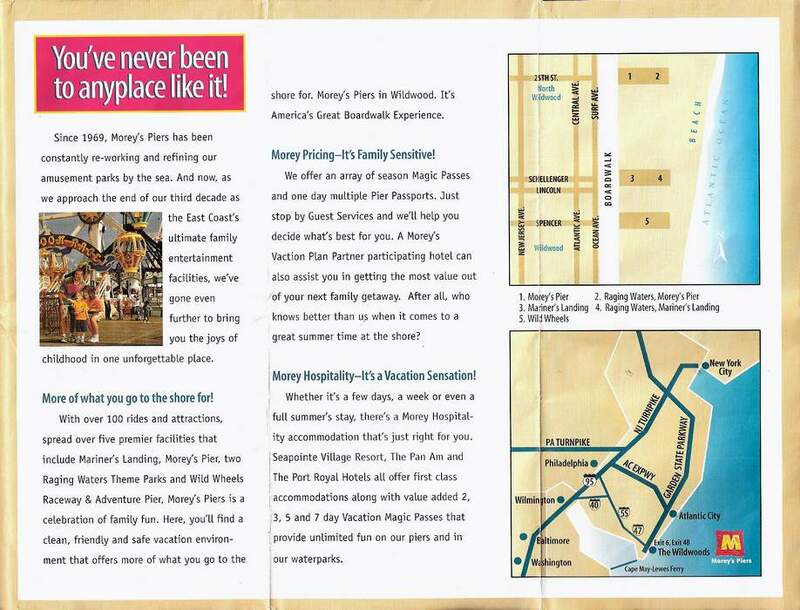 They even use the phrase “special Morey Magic.” Somone once said that they felt an un-easy aura at Morey’s Piers, like the place was built on an Indian burial ground…maybe that’s what they mean by Morey Magic! And just look at the smiling white family…how nice. In the middle is a schedule and pricing chart. Back then a 3 pier wristband was $22.95, today they just ask you for your wallet. On the right is the cover featuring the Great Nor’Easter with its old red color scheme. Also notice that the waterslide is red as well, I never remember that being red…what are they trying to pull here? 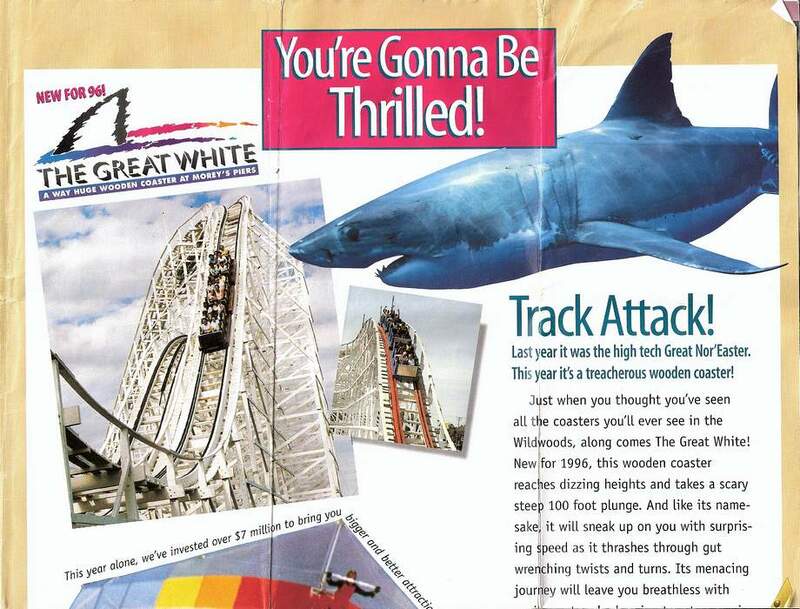 Morey’s patrons were indeed thrilled with the addition of the GCI built Great White in 1996. However upon even a moderately far glance, we can see that the two photos are not the Great White at all. They’re actually two different coasters with different paint schemes! At least choose one coaster for the two photos! 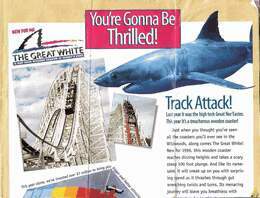 In the end, Great White looked very different from what was shown with steel supports and brown wooden track. 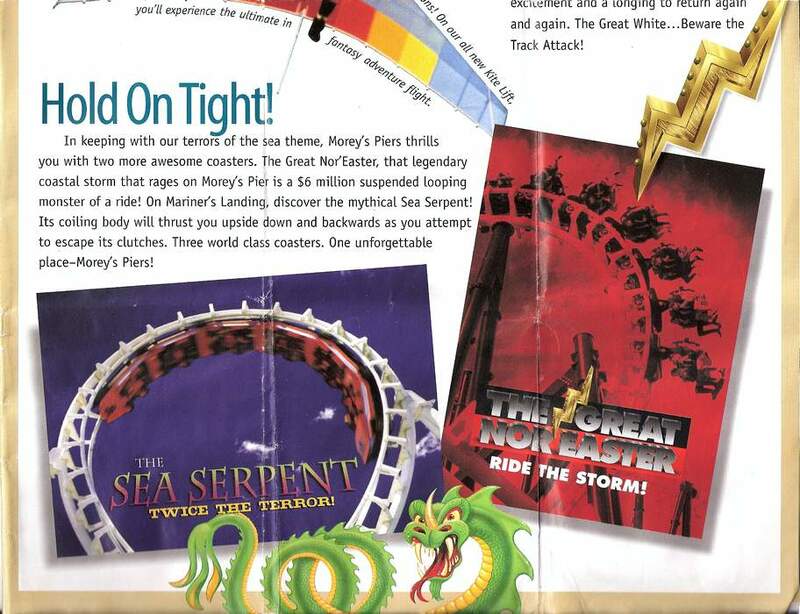 On the bottom part of the page we see the other two Moreys coasters, Sea Serpent and Great Nor’Easter, a Vekoma Boomerang and Vekoma SLC respectively. Sea Serpent, as I like to mention in nearly every Morey article I write, was the first Boomerang in the United States, built in 1984. Nor’Easter was built in 1995, one year after the SLC model debuted. 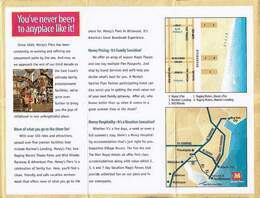 Maps, text and a photo of some dumb kid pointing out something stupid to his parents who are trying their best to care. You can’t see it too well in the photo to the left, so I took the liberty of resizing it. The top section of a four page spread. The words at the top in the pink box read out to say “Go Ahead. Make my Day.” Now I don’t think that fits the whole Morey’s image of 1996; I keep thinking of Clint Eastwood holding a gun in Sudden Impact while reading it. 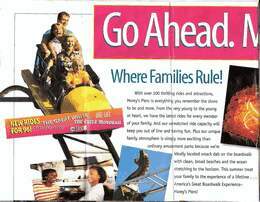 Featured in the photo is Morey’s Pier’s old Jet Star, which was an awesome coaster! 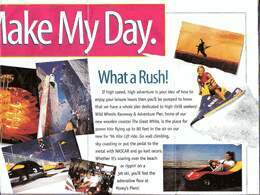 I remember it had no seatbelts at all; you just had to hold on and hope to not fall the hell out. Oh and look, it’s the same family from the first page! 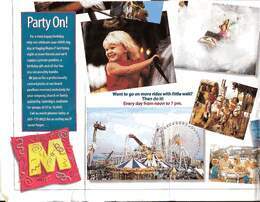 On the bottom part of the page we have a view of Mariner’s Landing pier, or “the pier with the ferris wheel.” The Giant Wheel, like the two big steel coasters of Morey’s Piers, is also a product of Vekoma. Also in the photo is the park’s old Weber manufactured ‘1001 Nachts’ ride. Morey’s Piers removed the ride around 2000 or so. Anthony’s MrBoardwalk page has a video of it on the bottom of the page: Anthony’s MrBoardwalk Nope, that site closed up before I could scrape the entire site. 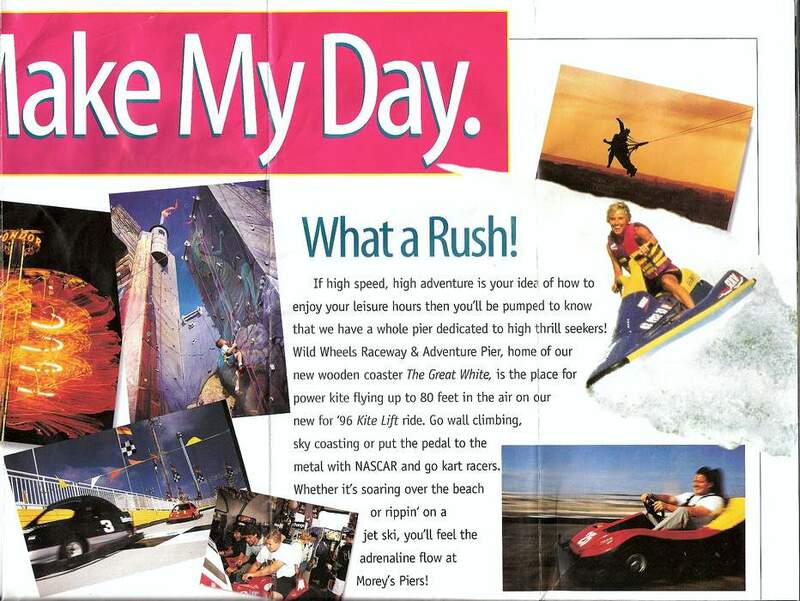 On the top right is a photo of a log flume car on Zoom Phloom with the old Moreys logo on it; it sort of reminds me of the old Six Flags Great Adventure logo. Just some other crap that Morey’s offered. 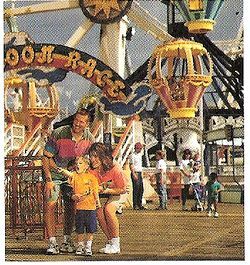 At one time Morey’s had a ton of Go-Kart tracks on Adventure Pier (back then known as Wild Wheels Pier) now they simply have one tucked in the back. The old Hunt’s Pier, now owned by Morey’s, is now home to a few Go-Kart tracks while they decide what to do with the pier. 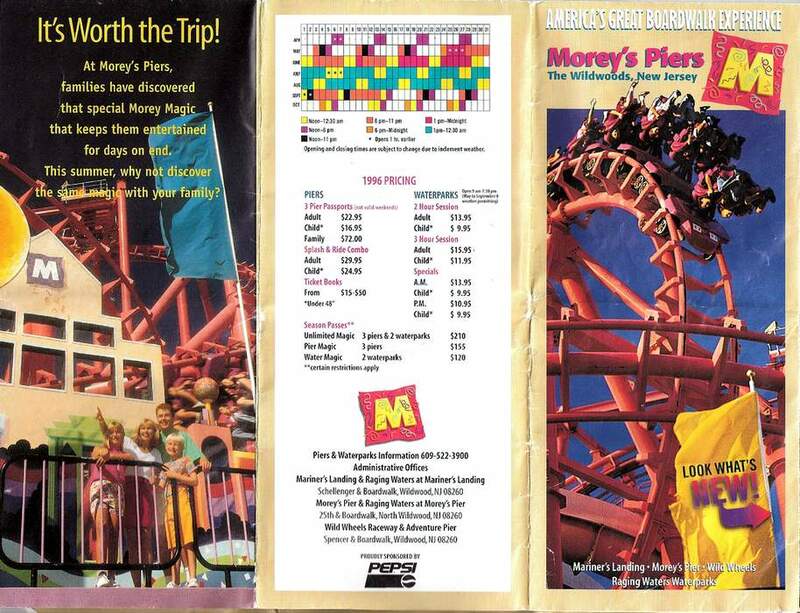 Finally we have a page on the waterparks owned by Morey’s Piers. 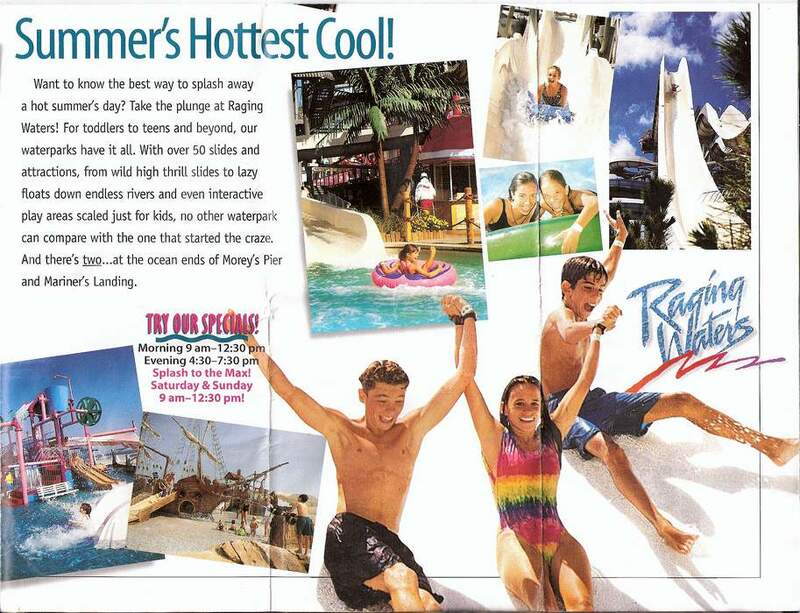 There’s two of them, one on Surfside Pier and one on Mariner’s Landing; they were both called Raging Waters back in the day. Each park has about seven slides each, a lazy river and activity pool. They claim to have “over 50 slides and attractions” which is true if you count every mirror image of a slide, unnamed slides connecting pools, and kiddie slides. Aside from the addition of kiddie play areas, the waterparks have remained virtually the same since the early 90s.